Hoping someone can give me some advice on best place to source the above and who might be best to fit it. I'm in London the next 2 days so anywhere whilst I'm here that could help? If not, anywhere Central Belt in Scotland would be good. Great watch I recently acquired a very similar one. I'm sure there will be other suggestions for fitting but for the pusher..... I needed some spare links for mine and after trying the usual places, Watchfinder came up trumps for me. You could speak to Amy in their Maidstone office, very friendly, helpful and on the ball she will search their entire organisation for you. Good luck. Thank you - that's a good shout! I'm minded to pop into Rolex at St James and see if they will help, guess that will be more expensive but probably quicker/less hassle and risk than other options! I'm gutted as only had the watch a couple of days and hard to part with it. No idea how it happened either, didn't knock or bang against anything that I noticed (and I'd certainly notice). Had just checked everything was screwed down properly the day before also. Oh well! That's a shame but I'm sure you'll get it sorted. Any idea where the pusher might be? Easier to fix with original pusher I would imagine. Plenty on here to help with fitting Duncan, Brendan, Paul to name a few. You could also pm Kerrie (100thmonkey) who may be able to help with the part. Yes Rusty, I was loving it too! 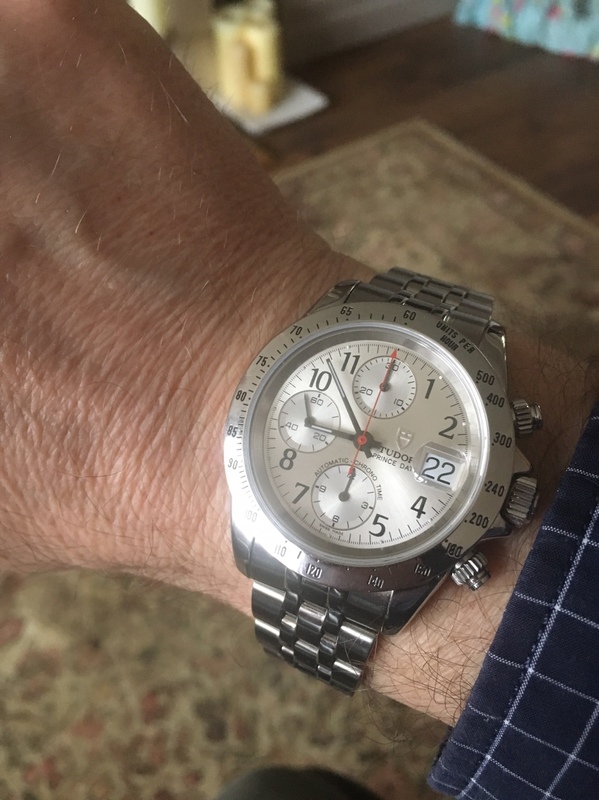 GMT back on today and it feels a lot heftier on the wrist. The Prince was perfect size, height, and weight. On plus side I will take opportunity for full service and then hopefully no further issues. The pusher is lost in the depths of the Underground. No idea when it came off, was shuffling around London for about an hour or so after the last point I checked the time before I noticed the damage. I have left it at RSC St James to see what they quote me - hopefully find out in next few days. Btw I meant to say before - you're one is lovely and looks great with the Arabic numerals. I normally think these look a bit busy with those, and you tend to see the more garish dial colours feature them too, but yours works perfectly and looks great! I've also PM'd Kerrie to see if there are other options for sourcing parts. Thanks again for the advice! Thanks for that, they're all great watches aren't they, the perfect size and dial colours and configurations. Rusty has a cracker as well! I hope you get things sorted keep us posted there'll be other options if you draw a blank. Yup a pusher from one of these is certainly not made of unobtainium. One’ll pop up. Thanks fellas - I've sent a couple of PMs but nothing yet. Will give Watchfinder a call. Rolex have sent me a quote for replacement pusher, crystal, and full service for £500. I've got plenty of time to go back to them, so will explore other options first - but would be happy to go down that route as I've no service history on the watch and it is over 10 years old. Plus I have peace of mind with Rolex - genuine parts, high quality service, plus essentially authenticates the watch as I bought it sans papers. The price I got the watch was very good and I budgeted 500-600 to get it serviced this year anyway. Main issue now is I'm very impatient to get it back on my wrist! Have a great Easter and I'll let you know how I get on. That sounds like a perfect and dare I say it sensibly priced solution all round! Yes Rusty - I was fearing that quote coming in, I can tell you In the end it seemed very reasonable to me. I'll wait and give people on here a few days to reply to my PMs and if nothing turns up by early next week I'll go with the 'gold standard' option! Fantastic. Loved reading that!! You still got both? Yes I agree, I'm actually pretty excited to get it serviced now so decided to email Rolex back and go for that option. I'm too impatient! Will be good as new when returned, I'm sure, and I will be able to wear safe in the knowledge it has been tested vigorously by Rolex. Can't wait! Thanks Aris, that was a really good read! Great pictures too and the distressed strap looked really top class. You seemed to slightly favour the Big Block, still feel the same or have you changed over time? I have to say the style and dimensions of my 79280p are just perfect for my preferences. Glorious watch. Yes I agree, I'm actually pretty excited to get it serviced now so decided to email Rolex back and go for that option. I'm too impatient! Will be good as new when returned, I'm sure, and I will be able to wear safe in the knowledge it has been tested vigorously by Rolex. Can't wait!Thanks Aris, that was a really good read! Great pictures too and the distressed strap looked really top class. You seemed to slightly favour the Big Block, still feel the same or have you changed over time? I have to say the style and dimensions of my 79280p are just perfect for my preferences. Glorious watch. I have always had a soft spot for toolwatches and still do. Glad to see you are still loving it, certainly a lovely wee group of Tudors you have. 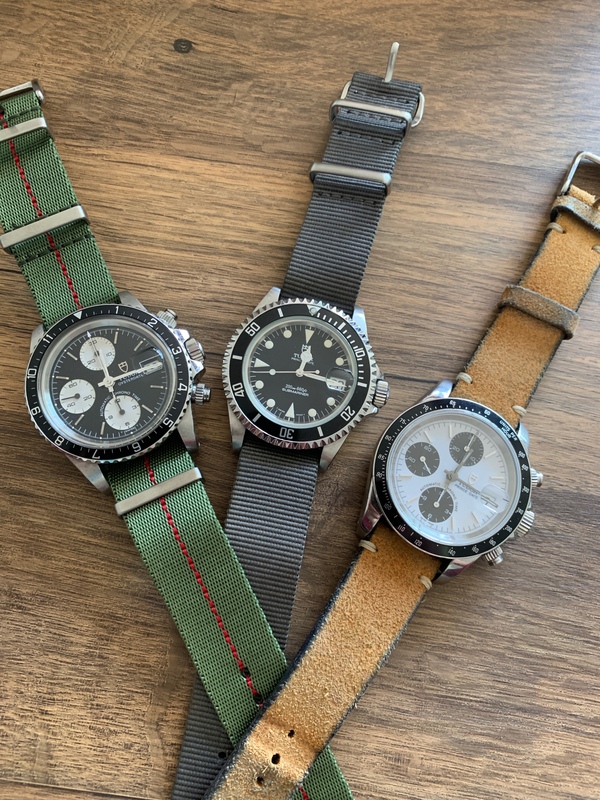 There are a few Tudors I'd like to add (currently have Pepsi GMT and Heritage Chrono with grey dial, as well as 79280p), really like the old subs so that would be a long-term aim. Would love to try on a BB58 if I could find one somewhere! And the Prince Oyster Date+Day would be wonderful too. Such a great brand with so many great watches! I’ve spent the last few weeks admiring these; they really are a lovely looking watch. What would be a reasonable price to expect to pay for one? Sorry to hear of your pusher, OP. Although i’m sure you’ll be enjoying it soon enough. Prices vary wildly but starting prices of £2k up to anywhere just south of £3750. Quite a wide range really. Thanks for the insight. These are firmly on my radar now. Thank you, was incredibly gutting when it happened but I've made my peace with it. I'm viewing it as an opportunity to have it serviced straight away, then I can give this gorgeous watch the wear it deserves! What Rusty has given as pricing was certainly my experience. 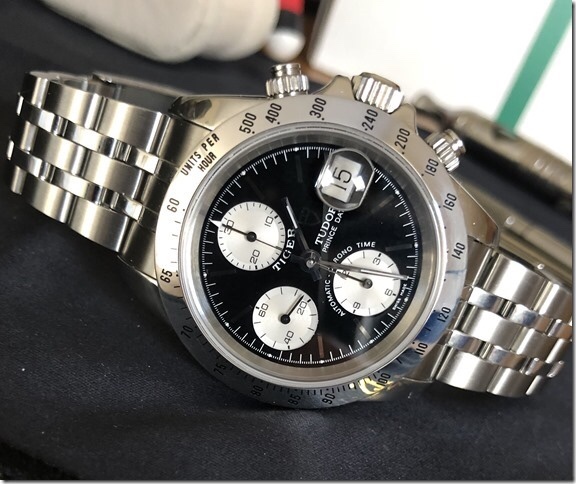 The ones around 2k mark generally tend to be the variety with more exotic dial colours - I was interested in Black, White, or Silver. However if you like Green or Blue you can tend to get them the cheaper end of the scale. The silver dial and white subdials version with baton markers are quite pricy. Mine came with no box or papers too, so I took a risk. On plus side I managed to source from Germany and therefore avoided paying any import fees, so swings and roundabouts. 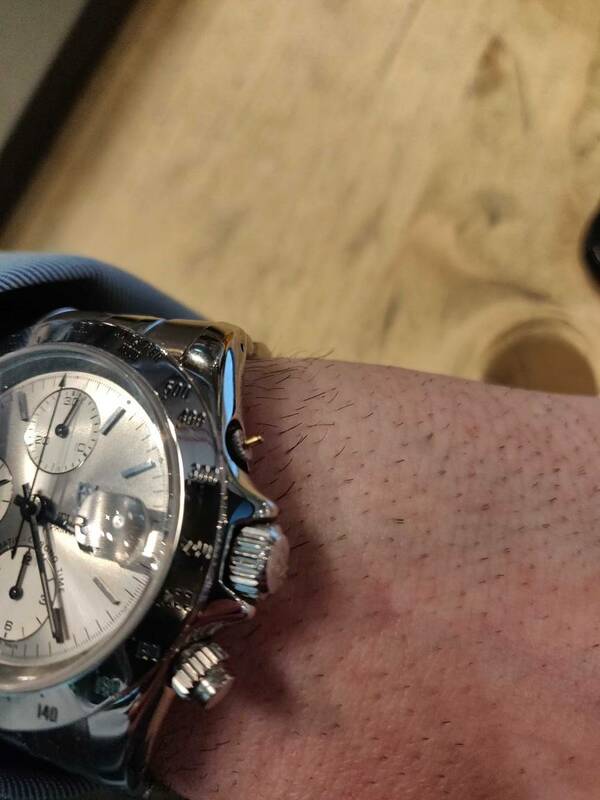 An expensive watch for me, but it really feels a cut above on the wrist. My photography skills are terrible so my pictures won't do it justice! Good luck in your hunt, let me know how you get on!